The $4.50/litre monopoly that Vitasoy has on rice milk around these parts has become superannoying since I started cooking every day. 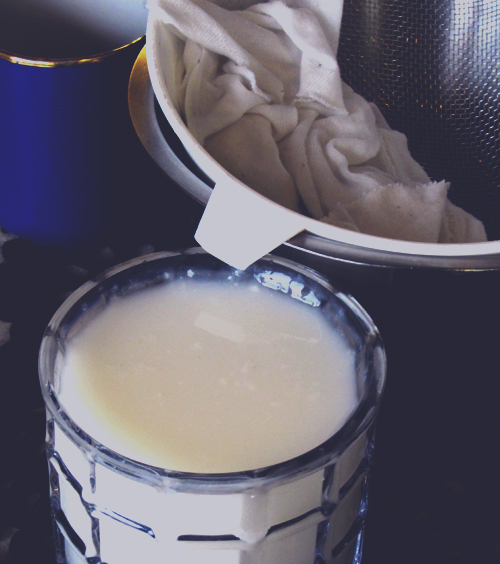 I always thought that making your own dairy-free milk was for commune dwellers and lovers of beige cardigans – and maybe it kind of is – but it turns out that it is also easy, cheap and awesome. If you are one of those rare old school types who like to drink milk by the glassful, this recipe isn’t for you – this milk needs company! – but if you want to make your cooking, baking and tea-drinking escapades lighter on your wallet, this is a cool way to do it. Blend rice and water for one minute, until smooth. 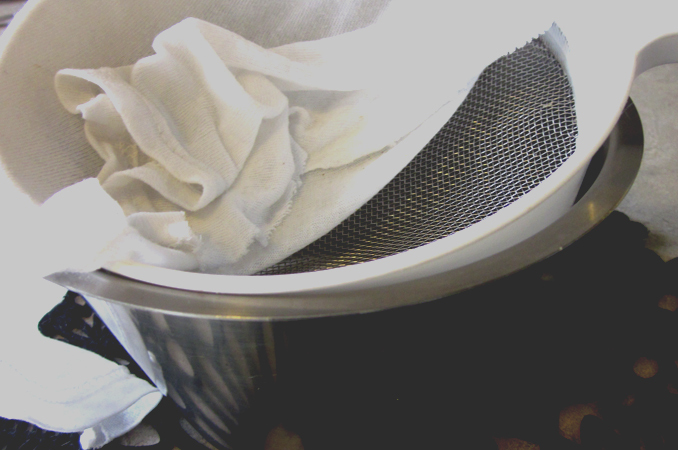 Drape the cloth across the sieve, and rest the sieve atop the bowl. Pour milk onto cloth-covered sieve in small batches, stirring constantly to help strain through the milk. It will take about five minutes. You’ll be left with rice milk in the bowl, and rice meal** in the sieve. Twist the four corners of cloth up and into the centre to form a cloth covered ball, and squeeze gently with your hands to get the last of the milk out. Pour milk into a sealable jar or container and refrigerate, using as needed in baking and beverages. It will thicken up a little in the fridge – thin it out with some water and you are good to go. I use a 1:2 ratio of milk to water, experiment and find out where the sweet spot is for you. Makes 5-6 cups of milk. Lasts up to 5 days. The finished product. Sooo much easier to make than I thought it would be. * …buy a whisk already! In Texas (and Mexico I guess) they call this “horchata”, many spice it up with a pinch of cinnamon. Rice milk is expensive here too.